Back in February Junko’s popular shojo manga, Kiss Him, Not Me!, came to an end in Japan. Spanning 14 volumes, the series was a success with fans of the manga, and now the anime adaption (which aired in Japan back in 2016) has been brought to the UK by Anime Limited. 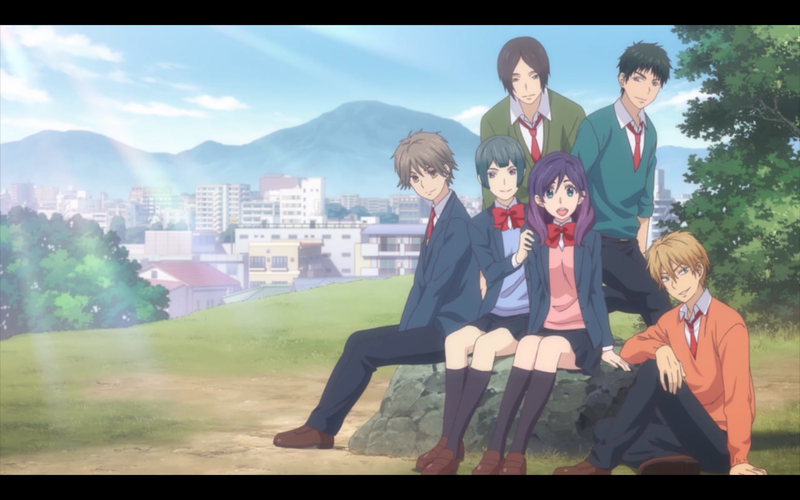 Is the anime series worthwhile for shojo fans? Before the death of Shion, Kae is (frankly) overweight and an average girl, but due to the week of starvation she’s suddenly lost all of that weight and become a beautiful woman – something everyone at her school notices when she attends the next day. Thanks to her new look, Kae has attracted the eye of four boys: classmates Yusuke Igarashi and Nozomu Nanashima (often just called Nana), fellow health committee member Hayato Shinomiya, and senior student Asuma Mutsumi (who appears to be going along with the flow). The boys collectively ask Kae out on a date but unfortunately Kae only has interest in shipping the boys with one another! 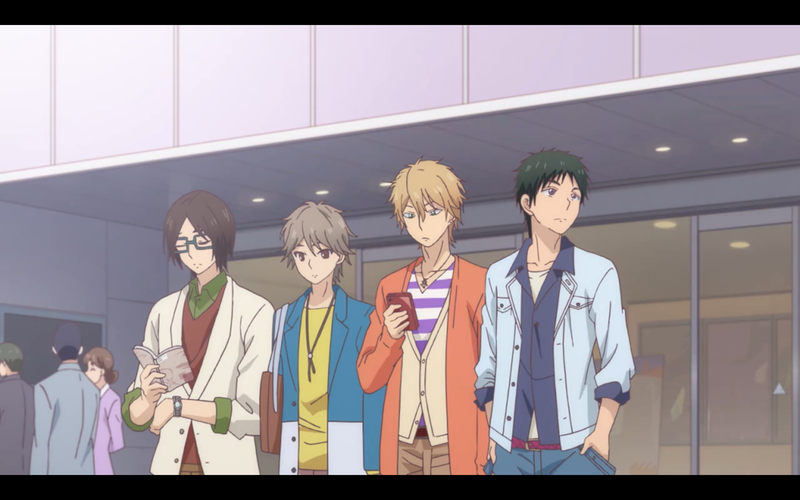 Unsure how to deal with their feelings toward her, Kae decides to go on a group date with the four boys while hiding her otaku passion. In the end, Kae can’t keep her hobbies secret and the boys are faced with a choice: accept Kae as she is and compete with one another to win her love – or back off. In the end, everyone decides that Kae is worth pursuing and do their best to win her over, but Kae simply goes on spending time with them while largely oblivious to their feelings. One thing’s for sure, there’s never going to be a dull moment them around! 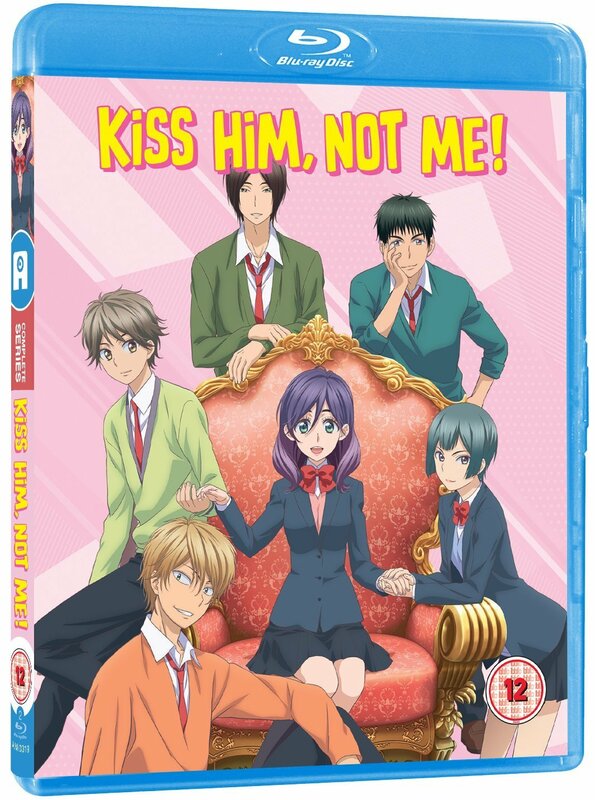 I’m a longtime fan of Kiss Him, Not Me!, having both read the manga and previously watched the anime prior to this rewatch for my review. What I’ve always liked about the series is that it never really takes itself seriously. It sets itself up with a silly premise and follows through with that stance until the end. The stories we’re treated to range from being mostly realistic (like the group taking a trip to Comiket) to downright ridiculous (for example, eating poison mushrooms and then hallucinating about fighting off an evil samurai). Although it does make efforts towards Kae eventually being coupled off with someone, that’s never at the forefront of the anime series’ mind. Instead it just aims to be downright fun. The other nice thing about Kiss Him, Not Me! is that although the story appears shallow due to all the boys falling for Kae’s looks, it works towards portraying the fact that the boys come to love her for who she is as a person. This tends to revolve around Kae becoming overweight again for a short period and how the group responds to it. Kae always does slim down again couple of episodes later though. As far as leading protagonists are concerned, Kae’s an extremely likable character who’s enthusiastic about her hobbies. 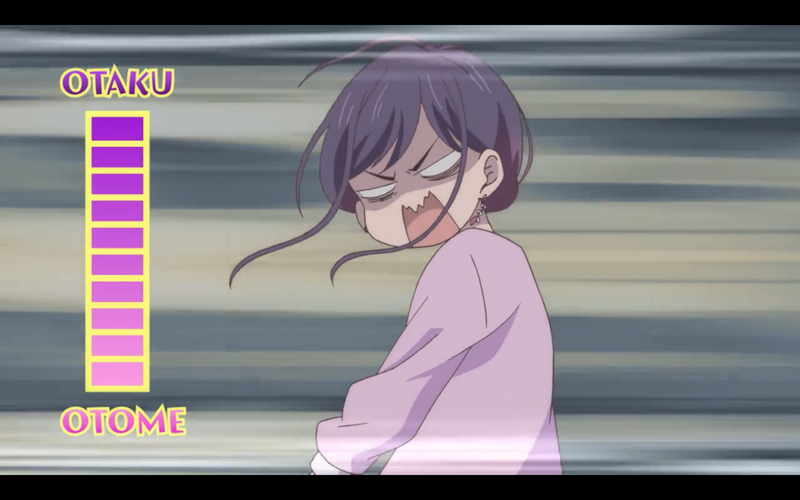 She’s very relatable to a viewer like me, who’s also very passionate about anime and otaku culture. This is amplified by her two female friends, Amane Nakano and Shima Nishina, who play off Kae and her fantasies. Nishina acts as yet another potential love interest for Kae but the majority of the time [her role is portrayed as] someone Kae can geek out with about her hobbies. While most of the boys have fairly stereotypical personalities, they’re also good characters. Igarashi is an existing acquaintance of Kae’s and is an all-around nice guy who is part of the football club. He can be a bit pushy at times but always means well. Nana is the ‘bad boy’ who actually has an incredibly soft side to him, mostly shown through his interactions with his younger sister. Shinomiya is a pretty boy, who’s somewhat shy and easily flustered. He became one of my favourite members of the cast due to being the easiest to relate to and he’s usually given the role of comic relief when things get heated. Finally, we have Mutsumi, who’s perhaps the only one among the boys who was close to Kae before her drastic weight loss. He’s a quiet and fairly reserved character, who’s not even sure he has feelings for Kae to begin with and largely goes with the flow. While everyone fits a particular archetype, the cast is a lot of fun to watch interact with one another. The animation for the series has been handled by Brain’s Base (Anonymous Noise, Durarara!! first season) and likely due to the studio’s work on many titles like it, Kiss Him, Not Me! looks great. The world is full of bright, vibrant colours and the characters are attractive and full of life. There are some great dramatic thunderclaps and shonen sequences thrown in for good measure, too, which complement the show well. Music for the series has been composed by Ruka Kawada (One Week Friends) and although it doesn’t really stand out, every piece works well within context. For example, there is one particular scene – when Kae outs herself as an otaku to the boys – where the music is perfect for adding a dramatic, earth-shattering feel. The opening for the series is “PrincexPrince” by From4to7, which is made up of the four male protagonists’ voice actors. The ending is “Dokidoki no Kaze” by Rie Murakawa. 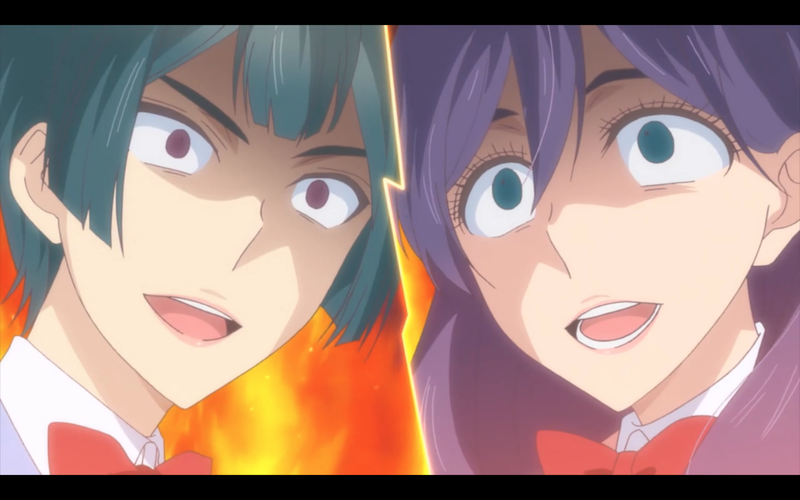 Both the opening and ending complement the series well with a fun and silly feeling to them. Where voice actors are concerned everyone performs well in the Japanese audio. My personal favourite is Yoshitsugu Matsuoka (Bell in Is It Wrong to Try to Pick Up Girls In a Dungeon?, Kirito in Sword Art Online), who plays Shinomiya and is a voice actor I’m very fond of. Rather than his typical ‘hero’ personality that he gives his other roles, Matsuoka makes Shinomiya cutesy and shy but also very caring. Meanwhile, Kae is expertly handled by Yu Kobayashi (Sasha Braus in Attack on Titan, Chain Sumeragi in Blood Blockade Battlefront), who plays the role with a lot of passion. The only oddity is that she conveys Kae with different tones depending on her body weight, which I find odd as I don’t think your voice would usually get that deep just from being overweight! When Kae is slim Kobayashi’s acting is fairly high pitched, so if you find her voice off-putting it’s probably worth checking out the dub. Speaking of which, while the US dub isn’t remarkable, Kae is played well by Jeannie Tirado (Fang in Black Clover, RyuZU in Clockwork Planet) who gives the character a more even tone than what we hear in the Japanese audio. While none of the acting for the male protagonists really stands out, nothing is suitably worth avoiding the dub for if you prefer it. As mentioned previously, this release is brought to the UK thanks to Anime Limited and is available on both DVD and Blu-ray. Both sets include all 12 episodes of the series with both their Japanese and English audio, as well as some trailers as the only on-disc extras. Overall Kiss Him, Not Me! 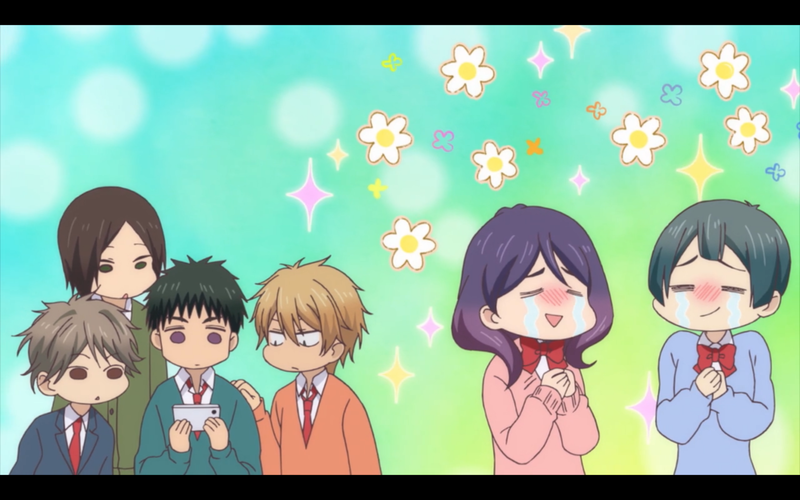 is a true delight for shojo fans. While there might be some questionable content in terms of its realism, the series is undeniably great fun and not as shallow as the first episode or two would suggest. Shojo, especially good shojo, is so frequently not brought to home video in the UK that this is a rare treat all fans of the genre should give a go. Having finished Snow White with the Red Hair, I still think it’s a very good shojo series. It doesn’t go out of its way to change what we’ve come to expect from shojo, but instead works to be one of the best shows in the genre.